7pm till late Tues-SatLunch and dinner bookings outside opening hours can be arranged on request. Far away in the land of Putney there is a small French bistro run by husband and wife team the Ardillys. This charming little restaurant has been loved by locals for over ten years. Outliving many of the other eateries that have come and gone in the area. This is the place that you don't want to tell your friends about, this is the secret you will want to keep all for yourself. A delicious gift from across the channel. You will find all the classic dishes on the menu at L'auberge, frogs legs, foie gras, d'escargot, veal and boeuf borguignon. 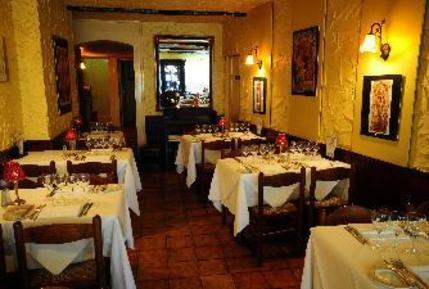 All cooked in traditional French style and served with effection. Be sure to save room for desert though, the chef originally trained as a patisserie so the puddings are truly not to be missed. The typical creme brulee is reinvented here with a divine honey and lavender twist. Spotting a gap in the market for those sick of bog-standard takeaway pizzas and curries. They created the 'French bites at home' service which allows fans of French gastronomy to dine on L'auberge delights in their own home, at quite easy-to-swallow prices. They also put on lots of event evenings which offer great food and wonderful wine at really great value. Bon appetit! L'auberge gyms, sporting activities, health & beauty and fitness. The best pubs near London L'auberge. L'auberge clubs, bars, cabaret nights, casinos and interesting nightlife. Where to have your meeting, conference, exhibition, private dining or training course near L'auberge. From cheap budget hotels to luxury 5 star hotels see our deals for L'auberge hotels, including The Lodge Hotel from 0% off.